Building High End Custom Pool Tables In America Since 1913. These pool tables are built to last forever and are not mass produced. The very best natural materials are used and are master crafted to world class standards. We can recreate - in the original hand, not reproduction, using tried and tested techniques - any style pool table, or help you create a one of a kind never built before design custom pool table incorporating time tested old world handcrafted techniques, such as hand hewn, mortise and tenon joined craftsmanship. Pool Table - As shown: Cedar Cypress wood with a walnut stain and a ten step hand rubbed finish (not fast process sprayed) - 56" W x 100" L x 32" T. This custom one of a kind H J Nick original pool table features a unique French Country style, with large Queen Anne curved legs and feet, all hand carved from 10" solid blocks of wood. View our matching custom Pool Cue Cabinet CFPB389. The billiards table design exceeds the equipment standards specified by the Billiard Congress of America. This pool table is regulation size, with a playing field of 44" W x 88" L and features a full 1-inch thick, three piece, over-sized Italian slate bed. The 5 3/4-inch wide rails on this custom billiards table are created from cherry wood and have hand beveled edges and beautiful inlaid mother of pearl diamond sights. The highest quality K-66 profile cushions and tournament felt (variety of colors available, shown in Spruce), have been used in creating this handcrafted billiards table. The pockets and baskets are designed to B.C.A. specifications and are created from high quality fine grained leather with tassels to provide years of enjoyment. The base piece on this custom pool table is designed out of exotic cedar cypress wood that has been reinforced with a steel framework. Decorative beveled skirt edging complements all four sides. Special mar proof leveling feet have been uses to ensure accurate leveling. All the wood surfaces on this handmade billiards table include a 10-step process hand applied finish. This handcrafted billiards table is shipped to your location ready to be set up and leveled by a qualified professional. Order a custom pool table for your Game Room. French Style Pool Table - Cushion Rails Vulcanized Gum Rubber - Cherry Solid Hardwood Top Rails - Mother Of Pearl Diamond Sights - 24 Ounce Billiard Cloth - 1" To 2" Best Quality Precision Ground Italian Slate - Handmade Leather Pockets - Solid Natural Air Dried Solid Cedar Cypress (renewable resource timber - not kiln force dried) - Original Craft, Not Reproduction Made In The Same Hand And Materials As The Original - Designed From The Historic Record - Hand Hewn, Mortise And Tenon Joined (means master crafted no fast process) - Built The Old Fashioned Way "When Everything Made In America Was Built To Last Forever" And Craftsmen Were Proud To Sign Their Work - All Species Of Wood Available - Structural Frames Using Solid Full Length Timber (no fake laminates, scarf joints or glued up parts, no veneers - no glue ups - no bolt ons) - Master Craftsmanship That Ensures Your Furnishing Will Stand The Test Of Time - A True Family Heirloom And Valuable Future Antiquity - All Carvings Hand Carved By Our Master Carvers (no cnc, faux casted resin carving or gang carving) - Fine Art 10 Process Hand Rubbed Finished To World Class Antique Collectors Standards (no spray on faux fast paint jobs) - Best Fabrics - Top Grain Leathers (processed American tanneries only) - Guaranteed Forever - Backed By Over A Century Of Fine Craftsmanship Since 1913. 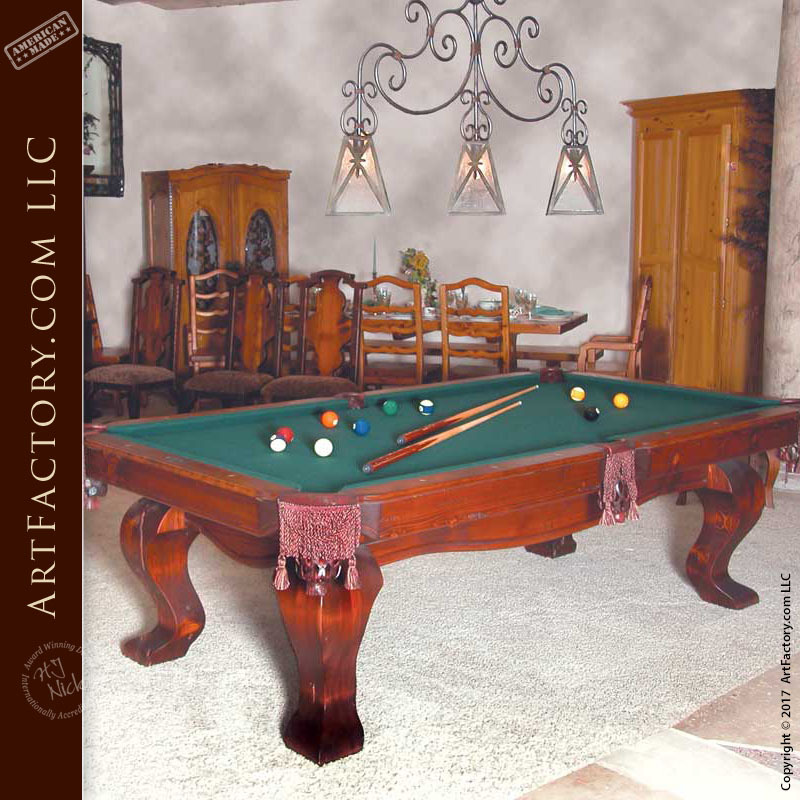 ArtFactory.com, an American manufacturer of custom pool tables, game room furniture, wood doors, gates, and designer furnishings based in Scottsdale, Arizona. Featuring designs by H.J. Nick, we have been designing and building some of the world's finest furnishings all hand crafted in America since 1913. Most of our clients want a furnishing that has a big WOW factor and timeless elegance. They all want investment value furnishings that make a proper statement reflecting their personality, or the personality of the environment for which the designer custom furnishings are intended. Our master level craftsmanship ensures your custom game tables and furnishings will stand the test of time, and are guaranteed forever, backed by over a century of fine craftsmanship.